for the x-space online gallery. 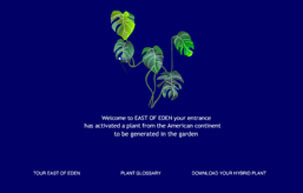 East of Eden is a virtual garden in a constant state of growth. 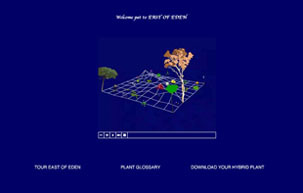 The instant a user logs on, flora native to the geographical location where the user logs in from is automatically digitally generated and planted in the garden. 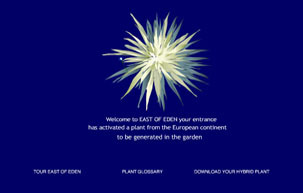 Over time the number of the differing flora generated in the garden will mirror the number and geographical diversity of the locations of the users who have logged on and had a presence in East of Eden. 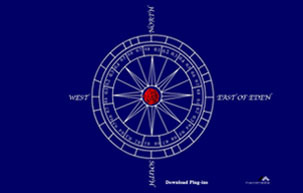 The history of empire, the military, mapping and botany are inextricably linked. Yearly in London in early summer to coincide with the military ceremonial parade which takes place on the occasion of the official birthday celebrations of Queen Elizabeth II, red geraniums, taking over from the spring red tulips, are planted in the Queens Gardens in the semicircular enclosure located at the top of the Mall in front of Buckingham Palace. These geraniums are cultivated to precisely match the scarlet colour of the ceremonial tunics of the Foot Guards of the Household Division who comprise the regiments of the military ceremonial pageant. The Victorian garden style bedding of the semicircular enclosure forms part of a regal processional way redesigned at the beginning of the 20th century in commemoration of Queen Victoria. An imperial space in the landscape of London, it constitutes a geographical location for military pageantry and ceremonial spectacle. 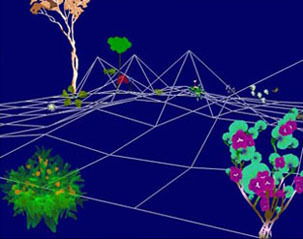 In his 'Essays on Travel' (1918), Robert Louise Stephenson noted, "inside a garden we can construct a country of our own". 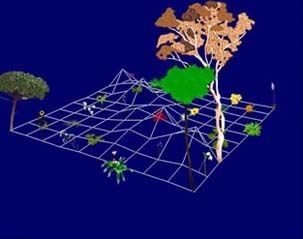 The recreation of an ideal landscape, a vision of paradise has been a constant preoccupation in the history of the world. The most famous the fabled Hanging Gardens of Babylon, was built by Nebuchadnezzar II for his homesick wife, who longed for the landscape of her native Persia and its pleasure gardens or 'paradeisos'. 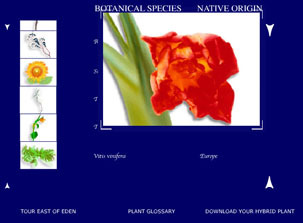 At the end of the last Ice Age you could only attribute about two hundred surviving species of indigenous flora to the landscape of Britain. 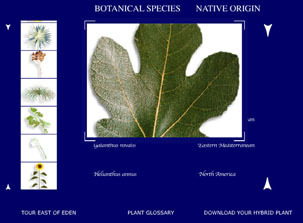 Subsequent plant introductions into the country have mirrored the geographical explorations and expansion of the British Empire; the date of the arrival of a plant has reflected the exploration of a new country. It is this endeavour that has shaped and developed the landscape and gardens of Britain. This introduction of foreign plants, in particular to gardens of the eighteenth and nineteenth centuries, became a horticultural expression of patriotism and imperial display, providing its audience with the power to imaginatively travel without ever having to leave the home.